Home Sweet Home is a ministry through Ascension Lutheran Church, which works with local community agencies to provide household furnishings to previously homeless members of the community. When these agencies have a client who is ready to transition into an apartment or house, after being homeless, they contact Home Sweet Home. A delivery time will be coordinated and a team established to help the client move the donated furnishings and necessities into their new apartment or house. Many of these clients literally have nothing to their name, so providing them with furnishings and home goods allows them to make a smooth transition and provides them with the comforts of home. Home goods and furnishings are donated by the community. By donating, supporting or volunteering to this wonderful ministry. 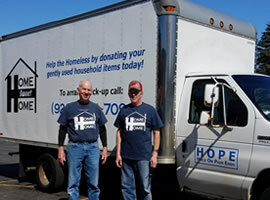 Donate any furniture and household items that you no longer need. Home Sweet Home will gladly provide pick up services directly to your home or business on Saturday mornings. Contact Home Sweet Home at 920-784-7092 for pick up information. Full or twin-size mattresses, frames and headboards, dressers, night tables, dining tables and chairs, microwaves, sofas and love seats, chairs, coffee tables, end tables and lamps. Toasters, coffee makers, dishes, glassware, silverware, pots and pans, kitchen utensils, vacuum cleaners, full and twin-size sheet sets, blankets and comforters, towels and wash cloths, cleaning items and personal hygiene items. HSH cannot accept sleeper sofa’s or TV’s. Support Home Sweet Home in its goal to work with local community agencies in helping the homeless furnish their home by giving a monetary donation. This can be sent to Ascension Lutheran Church at 2911 Libal Street, Green Bay, WI ,54301. If you are aware of anyone who has items that can be donated, please give them Home Sweet Home’s contact information. If you are a member of Ascension Lutheran Church you can volunteer your time by helping with donation pick up and furniture delivery as a mover or truck driver and organizing soft goods for delivery. Home Sweet Home is an outreach ministry of Ascension Lutheran Church that helps those formerly homeless, transition to a new home/apartment by providing, for free, basic home furnishings and supplies. It had been a long Saturday morning for our Home Sweet Home team. We were wrapping up our final move of the day which was particularly difficult: a high rise apartment with small elevators and security locks on the entrance doors. It had taken us better than an hour with multiple trips between the truck, the lobby entry, the elevator, and the apartment. The recipient was appreciative and we were now closing up the truck. As we parted, we wished God's blessings on her as she again thanked us. Every now and then God sends an unexpected blessing to our HSH ministry. I realized the importance of this ministry when a fifty year old man we were moving in, explained that this was the very first bed he had ever owned. His excitement was endearing and made me appreciate all the blessings I take for granted.